I thought today would be a good day to talk gardening. The temperature here in Edmonton is hovering right around zero, and we are in the middle of a snow storm that would make regular snow storms cry. This past weekend though, it was beautiful in the yard and when Baby Bird went down for her nap, I took an hour and a half to myself and headed outside to get acquainted with our new yard. I want to talk a bit about suckers. Not the kind that will fork over their PIN number because you told them they won an international lottery hosted by Microsoft. I mean the secondary shoots that grow from the base or roots of a woody plant or tree. Not all suckers are bad. For example, some suckers can turn a small tree into more of a bush-like feature if that is what you are going for. Here is one of the small bushes in my yard that seems to have come from a small tree. You can see the previous owners cut down the bigger trunk near the base to make it more bush-like. Perhaps so it will fit nicely along the back fence. I am excited to see what this one will look like in bloom. You can see the buds here. Can’t wait until they open. In other instances, suckers either aren’t a good thing to have and in some cases can also be a sign that your plant (or tree) is hurting. 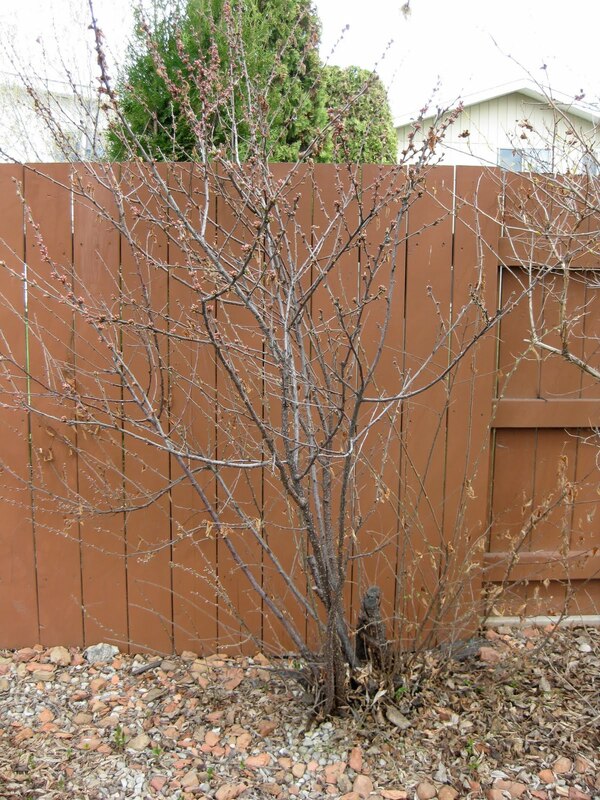 Before you get worried about all of the plants in your yard that have suckers, you need to know that some plants and trees are prone to suckering and will do so regardless. Check online or with your local nursery if you’re worried. So now on to my ugly suckers and my suckers that are indicating a problem. The Ugly Suckers… I think this is a Lilac. I’ll know once it blooms. In the first picture you can see the suckers coming up around the tree. I personally think this looks ugly. It hides the shapes of the individual trunks and it looks messy to me. Here’s the same shot after I pruned the suckers out. What do you think? Here’s more of a close up before shot. And the close up after shot. It just looks less cluttered to me. 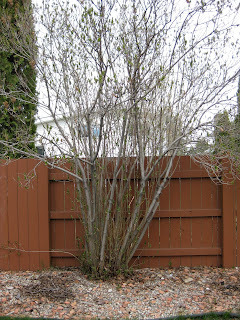 Pruning suckers back can help the plant. The plant can then focus on putting it’s energy back into the rest of the tree. Here is an example of a tree in distress. There is no previous evidence that this tree has ever suckered before, yet if you click and enlarge this photo, you can see so small shoots coming up from the base. These need to be pruned and further attention needs to be paid to this tree. Which brings me to this weather. Since we are in the middle of a snow storm, I can only sit back and be thankful that eventually this snow will turn to water and will begin to give my tree the water it needs. Shortly I will follow that up by watering it at the roots and will pick up some good tree food for it to give it what it needs. 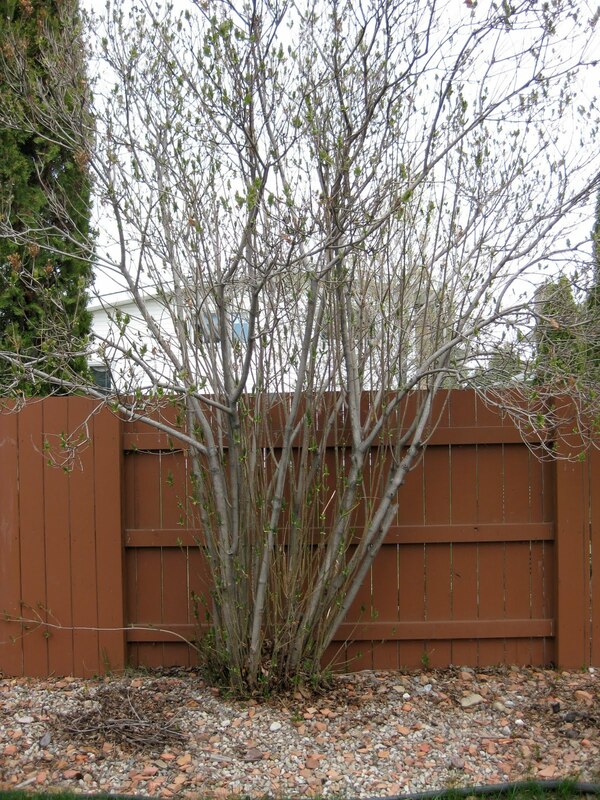 TIP: When pruning back suckers, get as close to the base of the sucker as possible to deter it from growing back. In our old house, we watered all of our plants and trees really well just before the first snowfall. This always helped them through the winter months and we will do the same with these trees this fall. I hope I don’t see any suckers next spring! We had a Mayday at our old house. It is a cousin of the cherry tree and I was told that Mayday's and cherry trees are prone to suckering. I remember stepping on those prickly suckers after we cut them down too – not fun. Good luck with the apple tree – will be nice to enjoy the fruit! We just cut down a tree that was sending suckers out through out the yard. The little "stumps" left over after we cut the suckers back were sharp and pointy. Not good for the "Little" bare feet when running through the yard. 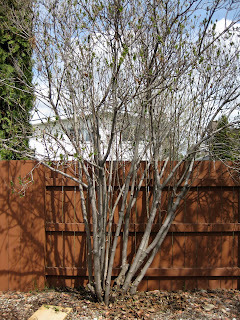 I think the tree was a chokecherry…. We still have to kill the stump and dig it up. Once that is done the suckers should die off. I will be replacing the tree with an apply tree so that we can enjoy "the fruits of our labour"!! !